So, I'm left with rummaging through a relatively-empty refrigerator looking for anything that might sustain me. Spicy mustard and mayo on a warmed up tortilla? Hmmm not so appealing. Luckily, our veggie box came a couple of days ago and there were 2 beautiful beets calling my name. 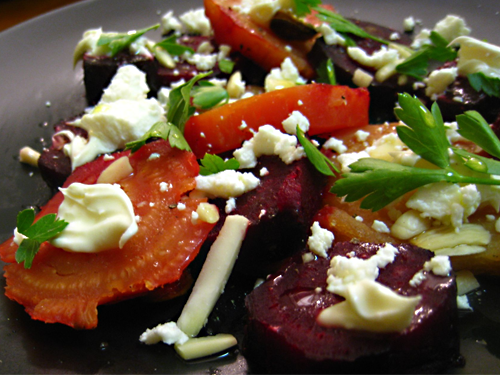 Beets - the best solution for when you just don't want to think about dinner, but want something mildly flavorful. Or, you just feel like staining the whole kitchen. Why are they so great? Because, you essentially just drizzle with oil, throw them in a pan, and leave them in the oven for 45-60 minutes. Take out, peel, season with salt and pepper, and voila! A nutritious, delicious meal. Even though that alone would've sufficed, I decided to take it a step further by actually adding other ingredients - slivered almonds, a bit of italian parsley, goat cheese, and some leftover mascarpone/craime fraiche spread I still had lying around from the salmon rolls. I think I accidentally came across something magical - that spread took those beets to the next level. I felt like in every bite I was discovering a new flavor, all of which complimented each other nicely. It seems I have a new recipe for my repertoire! You have to consider the color of the plate you shoot something like this on. One semester of teaching photography again and I'm already a critic...can you believe it. I would have gone for a soft celedon.